I’ve wanted to write about this trip for awhile, and haven’t had time to sit down and organize my thoughts. Well, I broke my ankle and now I’m on a forced break (pun entirely intended), so here we are! 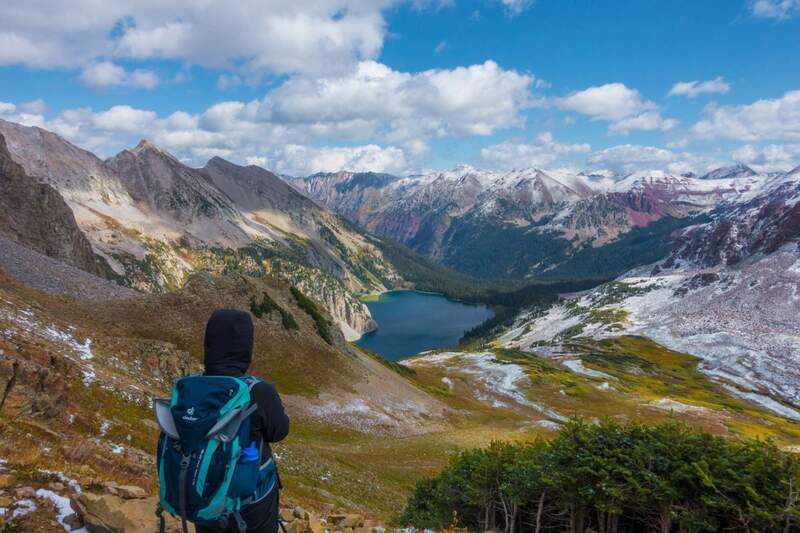 Four Pass Loop is probably one of my top 3 favorite backpacking trips. K and I got really lucky tho, it was right after the first snow (mid Sept) so the mountains were beautiful. It was also freezing, but I’ve chosen to mostly forget that part. Four pass loop starts at Maroon Lake, and meanders over four 12000ft+ passes (hence the name). 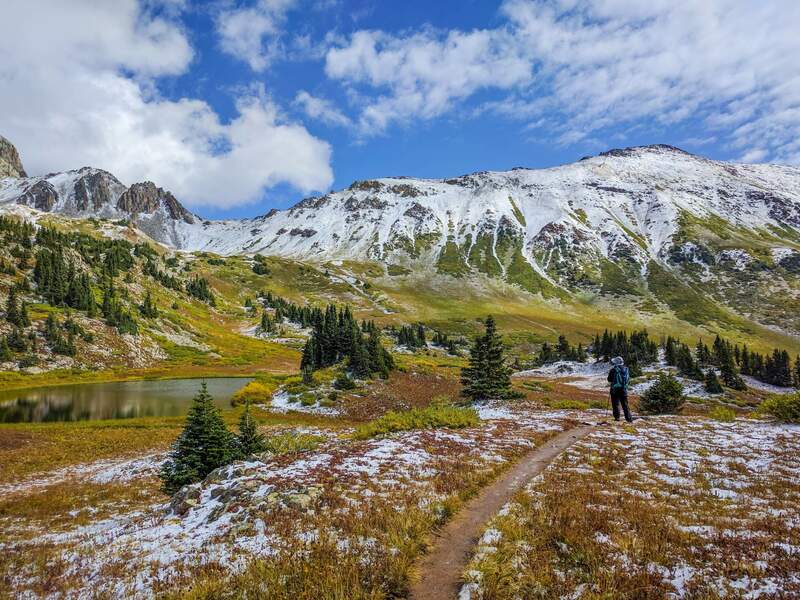 It also passes by Snowmass Lake, which is another popular out and back backpacking destination. The loop is about ~28 miles in total, and ~8000 ft of gain/loss over that. 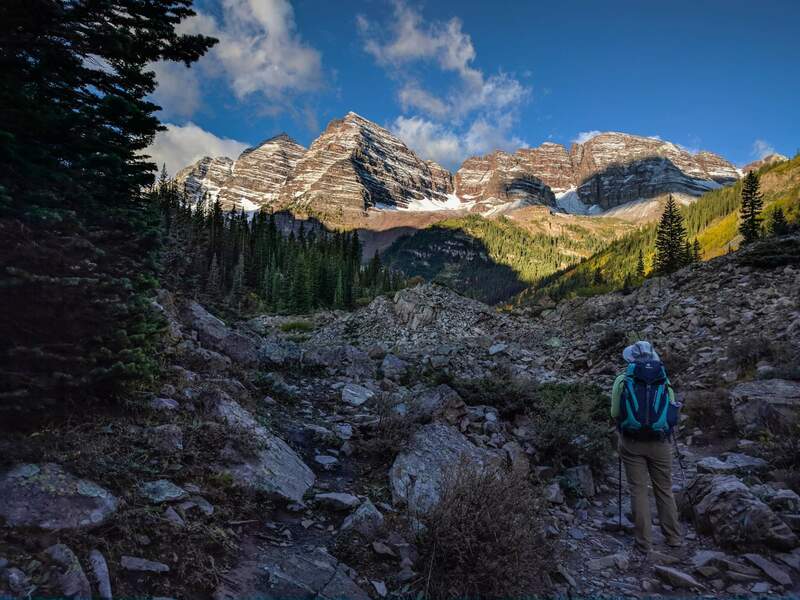 We did the loop clockwise, starting at Maroon Bells and going over West Maroon and Frigid Air pass the first day, then Trail Rider and Buckskin pass the next day. Once again, I don’t really recommend doing this loop in 2 days (I say this a lot), we were fairly acclimatized and hiking all summer, so by then we were in decent shape. We also saw a few crazy trail runners doing this in one day, they are nuts! We woke up really early because we were worried about getting parking at the trail head, we got there around 5am and parking wasn’t a problem (Friday early morning), there were multiple spots in the overnight lot. We were also greeted by this sunrise. After ooh-ing and aah-ing at the sunrise, K and I then started slowly meandering up towards West Maroon pass, our progress was quite slow as we couldn’t stop taking pictures and staring at the views. The panoramic photos are the best (IMHO), and unfortunately they don’t look so good in this blog format, I hope it’s inspiring anyways! At the top of West Maroon pass we met lots of hikers doing a day hike from Maroon Bells to Crested Butte, they get picked up by a shuttle at the other end. Given how pretty the hike was on this section, I would totally recommend doing this option if you don’t want to backpack the whole loop. After that we dropped down and back up to Fridge Air Pass, we continued our way down to find a campsite. I don’t remember either of these passes being difficult, probably because it was so pretty I was just busy staring at everything. There were lots of available campsites between Frigid Air and Trail Rider pass. Unfortunately my GPS watch died so I don’t know how far along we went along this section until we camped. We pretty much cooked dinner and attempted to pass out. The overnight was supposed to be uneventful, with no snow in the forecast. Guess what? It snowed, and we woke up multiple times at night to knock snow off the tent fly so it wouldn’t sag and cause condensation on the tent itself. Never trust the forecast in the mountains!! The next morning we got a pretty late start because it was freezing and things were a bit wet. At this point K and I weren’t really sure if we were going to overnight at Snowmass Lake or continue to our car, we packed up everything and slowly made our way towards the next pass. I was a little cranky since things were wet and it was cold. 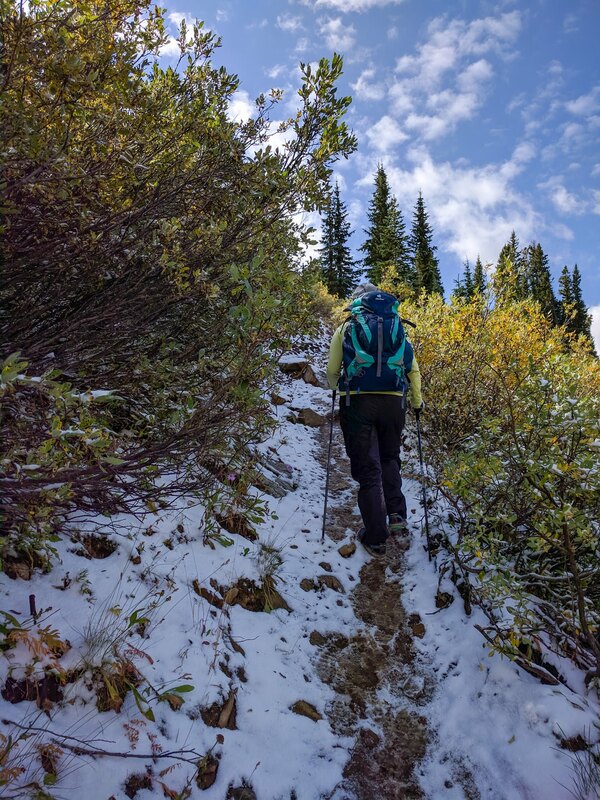 I was also a little worried about the condition of the passes given the overnight snow, I did not want to deal with icy trail. Once we got going I was less worried, the trail was quite reasonable and it was a beautiful day. The top area of Trail Rider Pass was absolutely beautiful, we spent a lot of time here taking pictures and debating if we should hike out that day. The downhill towards Snowmass was probably the toughest section of trail, it was just rocky and you had to be a bit careful picking your way downhill. The views of Snowmass lake tho were spectacular. Or maybe I’m just easily pleased. My memory a little bit hazy about the trail after Snowmass Lake, we ate lunch at the lake, and somehow decided to go up Buckskin pass (8 miles, and ~2k feet up and 3k feet down) and get home that night. I remember being a bit tired going up Buckskin, and lamenting it wasn’t as pretty as the other passes because the snow melted already. Gosh we sound so spoiled. 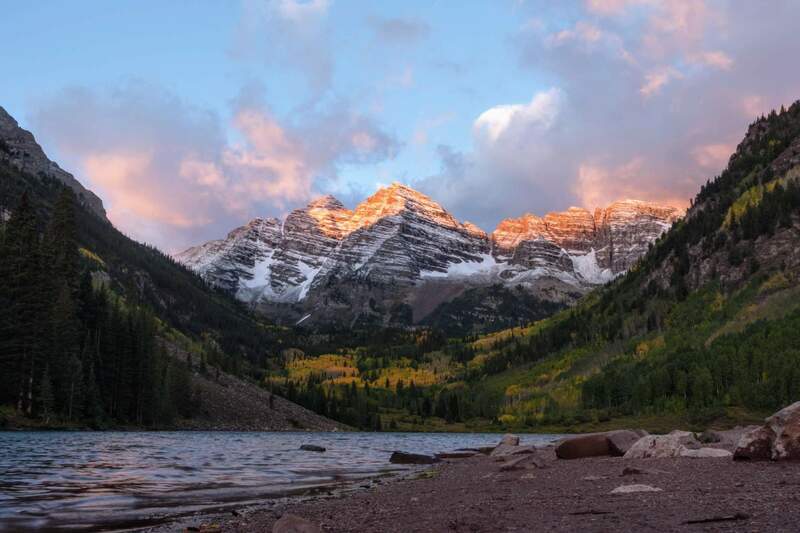 After Buckskin Pass, we made it back to Maroon Lake right before sunset (not as pretty as sunrise), stuffed our faces in Snowmass village, and made it home before midnight!